In our neighborhood, there aren’t many supermarkets. Even that’s an overstatement; there actually isn’t a single supermarket anywhere near us. So we’ve had to become familiar the local market, or “chợ”. And the market’s vendors have had to become familiar with us. 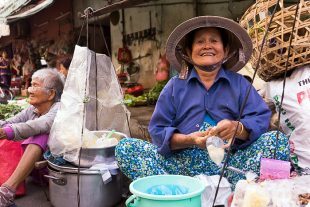 Trust is a two-way street, people… and Saigon’s markets are worlds unto themselves.